Canterbury Place, built by Centex homes in 2006, is one of the youngest neighborhoods in Abacoa in Jupiter, Florida. The architectural styles of the houses are Tuscan and French in design. They are surrounded by lush plants, many trees and green grass, which brings about a very homey and neighborly feel to the residents. A small body of water divides the neighborhood into north and south sections. Canterbury Place’s houses on the north are single family homes while houses on the south side of the neighborhood consist of both single family homes and townhouses. Lighthouse Elementary and Jupiter Middle School are just a stone’s throw away from Canterbury Place, so sending your children off to school is going to be a breeze. 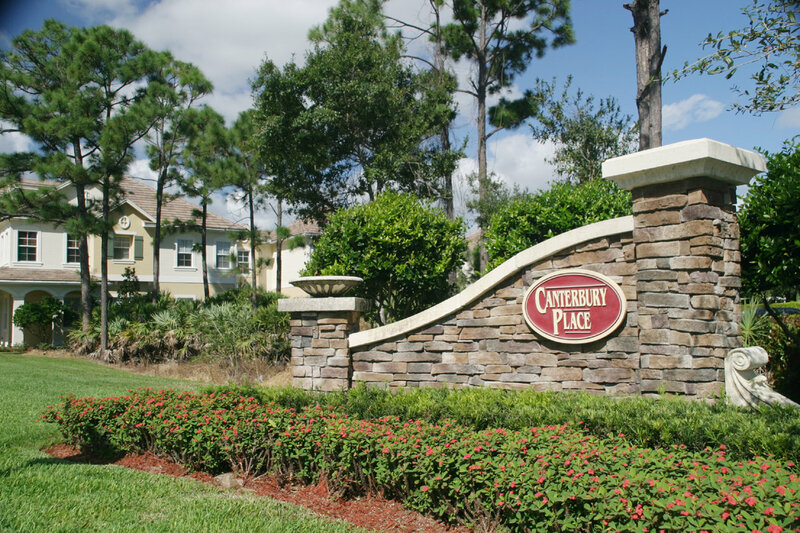 Canterbury Place is one of the many residential neighborhoods in Abacoa, a master-planned and thoughtfully designed area of Jupiter that boasts 20 different neighborhoods each with their own architecture and style, designed to encourage community living and involvement. The land was once owned by John D MacArthur, a businessman and philanthropist. Click here for more on Abacoa. From this neighborhood, you can easily walk or bike to many different local restaurants and shops, watch Minor League baseball games and Major League Spring Training at Roger Dean Stadium, enjoy live music and entertainment at Abacoa’s amphitheatre and join in the ultimate picnic once a month with the Food Truck Invasion. Also close by are a skate park, football and soccer fields, basketball and racquetball courts, the library, aquatic center and much more! Children of Canterbury Place residents attend 'A' rated schools.